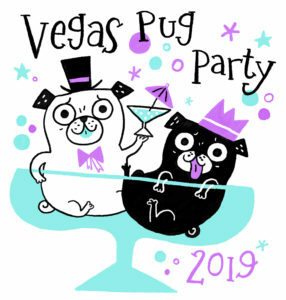 We have room for 24 vendors/artists/exhibitors at Vegas Pug Party for Saturday’s main convention day on March 2nd, 2019. This will be on a first come-first served basis. Tabletop displays are $120 per table- this includes (1) 6’x30” table, hotel linen, (2) chairs, (1) wastebasket and water service. Electric, if needed, is $165 per table- this will include a 7 plug Power Strip With Extension Cord. Set up will be on Saturday, March 2nd, 2019 from 7:00am to 9:45am. Booth must be completed and ready for business no later than 9:45am on Saturday and maintained from 10:00am until 4:00pm. Breakdown must be completed no later than 6pm on Saturday after the event closes. interested in being a vendor/artist/exhibitor at Vegas Pug Party, please fill out our Vendor/Exhibitor Interest form below. We will then email everyone on our interest list our application once it is available.